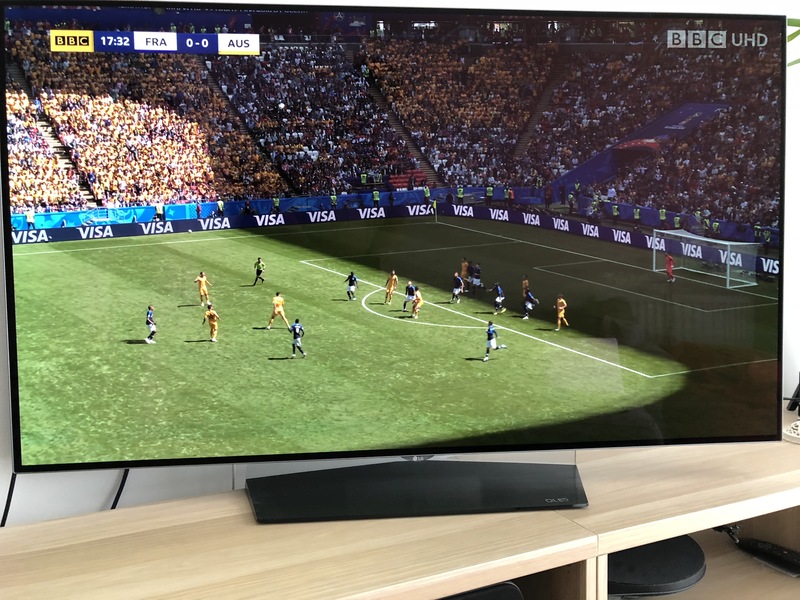 The BBC is running the UK’s first live 4K UHD HDR broadcast trial for the Russian 2018 World Cup. It’s broadcast via the BBC iPlayer app directly on compatible smart TVs, The BBC do have a list of compatible TVs, but this isn’t a complete list. Due to constraints in live encoding of UHD material, there are less renditions generated for live UHD content compared to the previous trial of non linear (Blue Planet 2) content. This means that there is only one true 4k rendition available, 3840x2160p at 50fps at a bitrate of 36Mbit/s. The BBC’s blog post has more technical information, including information on other renditions at lower resolutions. You’re going to need at least a 40Mb internet connection to watch in UHD, but ideally more – especially if your TV is connected by Wi-Fi, which for many people will struggle to provide a consistent enough connection to support that – especially if you’ve got lots of devices connected or have a crowded wifi spectrum where you live. So, can I watch in the World Cup in UHD 4k? The first thing to do is find out if your TV is compatible. You can check the list here, but the best way to check is to see if the UHD test loop is available to you. The UHD test loop is currently broadcasting around 10 minutes of coverage of an FA Cup fixture. 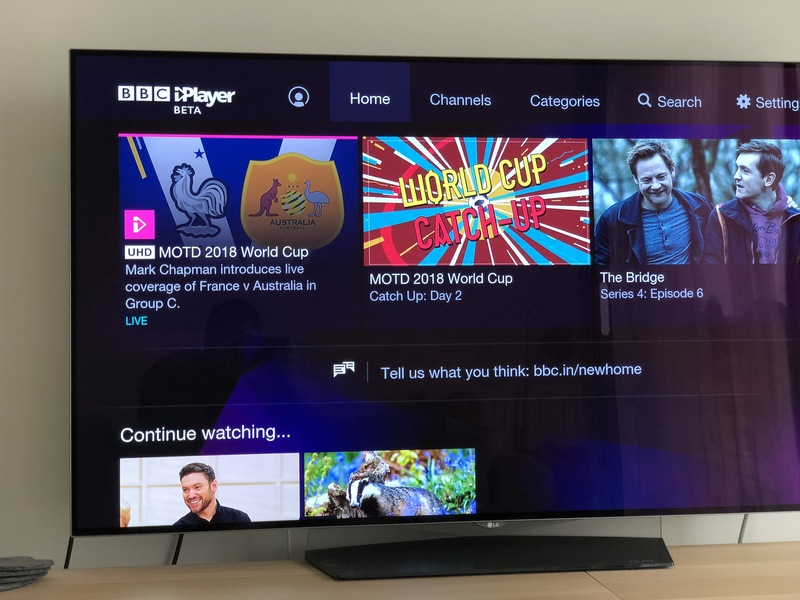 You can access it by opening the BBC iPlayer app on your smart TV. You need to do this directly on your TV (or a Roku device, which appears to be the only supported external device – but it does not support HLG HDR) – things like Nvidia shield, Games Consoles or Fire TV sticks aren’t supported. Once you’re in the iPlayer app, go across to settings and pick the “try new features” option. If at the bottom of the list you see a “UHD Test Loop” option, your TV is supported for UHD content. If you only see standard and beta, then unfortunately your TV is not supported. How do I tune in to the 4k broadcast? 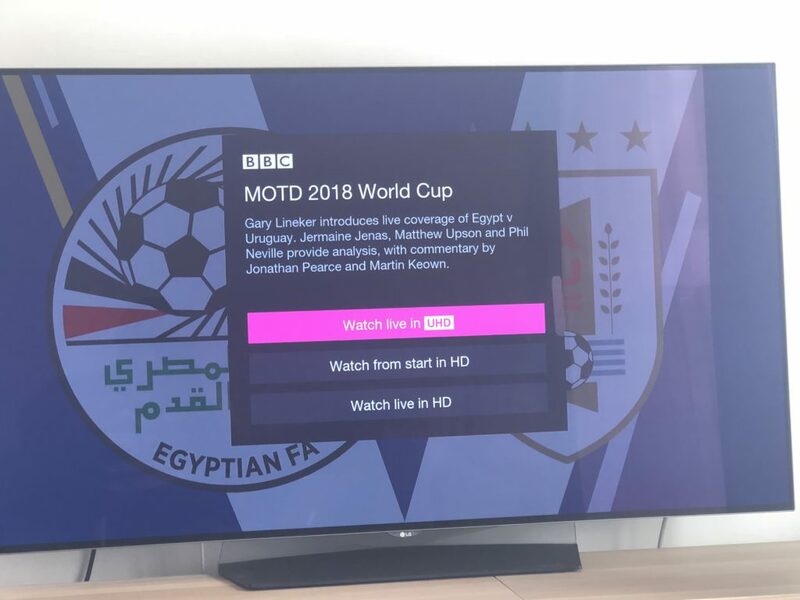 Once the BBC’s World Cup Match of the Day program starts on BBC1 (or whatever other channel they’re showing it) it will take a few minutes for the option to appear on iPlayer. This has ranged between 1 minute and 5 minutes for the 3 games that have aired so far. You want to select the home tab of BBC iPlayer. If you’re too early, you can just keep pressing select on the home tab to make it refresh without having to restart the app. 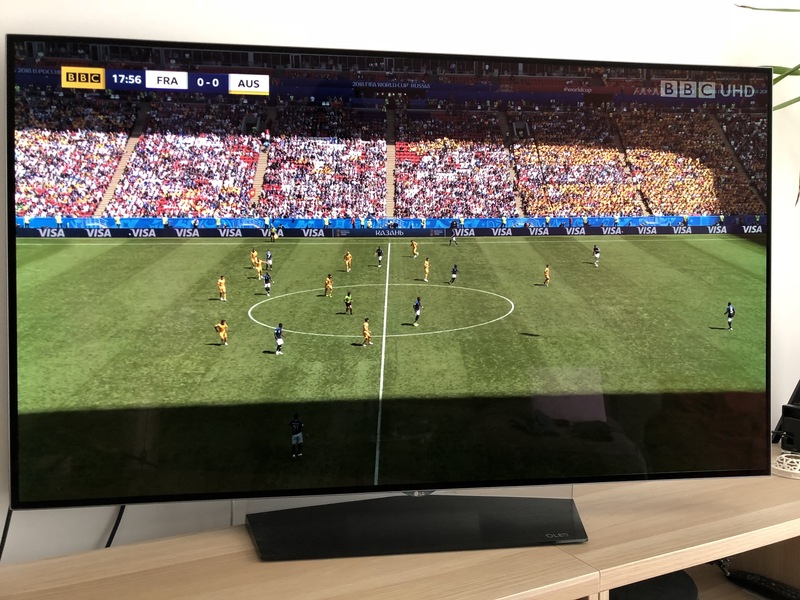 Once available, the first panel of the home tab will show the UHD program, as shown in the image below of this morning’s France vs Australia game. Why does the BBC iPlayer Ultra HD World Cup feed keep buffering? I’m on a fibre to the premises 200Mbps connection with purely gigabit cabling and a very powerful router handling everything, which means I’m in the fortunate position of knowing any buffering issues aren’t related to my home equipment, and must be either BT’s (or BBC’s) network, or the iPlayer servers. 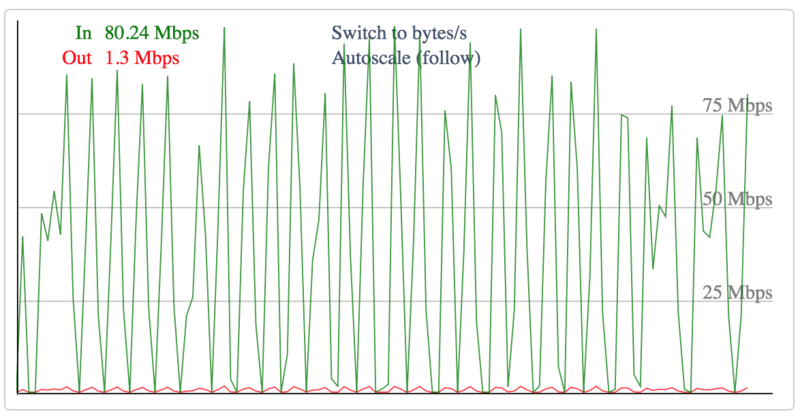 That said, if you get persistent buffering it’s likely caused by one of two things. 1. Your internet connection isn’t fast enough to support such a high bitrate. Because The BBC are broadcasting in 50fps (which is the right call for UHD content – the smooth fluid video is an important part of the UHD HDR experience), you’ll need at least double the bandwidth of what streaming 4K UHD content on Netflix or Amazon would require. There’s also a less significant overhead of a few hundred kilobits per second by the fact live UHD HEVC encoders are less efficient than offline encoders which helps contribute to the bandwidth requirement. So while the BBC say you need at least 40Mbps, if you’re on a line near you’re going to need to make sure other people aren’t doing anything on the internet or you’ll going to have issues. 2. You’re trying to use Wi-Fi which isn’t strong enough to support such a high bitrate. Wi-Fi signal quality and speed varies drastically across different devices and environment, and the vast majority of issues if you’re connected by Wi-Fi will be related to that. If you can, switch to wired.Most ISP provided Wi-Fi routers aren’t very good, and definitely aren’t capable of supporting as many devices as most homes have along with a UHD stream. How much bandwidth will watching a World Cup game in UHD consume? I ran some tests during the first game shown in UHD yesterday, and it used a little over 42GB – that’s the complete UHD program from start to finish, including build up and wrap up. Some games have a longer presentation so will use a bit more. Because iPlayer uses DVB-DASH (a form of MPEG-DASH), the video/audio transport stream is downloaded in 5 (or maybe 10 – it’s hard to know as it’s encrypted!) second chunks. This means that if you have a faster connection, these chunks will download as fast as possible. In my case, they download at around 80Mbit/s meaning that it is only downloading video for ~2.5 seconds out of every 5. Is the whole programme native 4K UHD? The host broadcast feed (or “world feed”) is native 4K UHD HDR – though not HLG HDR. It is converted to HLG as part of the broadcast output, so any live pictures from the stadium are native 4K UHD, but any BBC studio replays of previous games, or the current game you’re watching aren’t native. This is particularly noticeable when the BBC show slow motion clips, which are 1080p slowed down and then unconverted to 2160p50, which after watching 50fps coverage is clearly noticeable. Why is the picture so dark? One of the perks of using HDR is the expanded colour space provided by the BT.2020 profile and the wider brightness range of HLG (1,000 nits) is that you will see a much more accurate representation of what the camera sees. 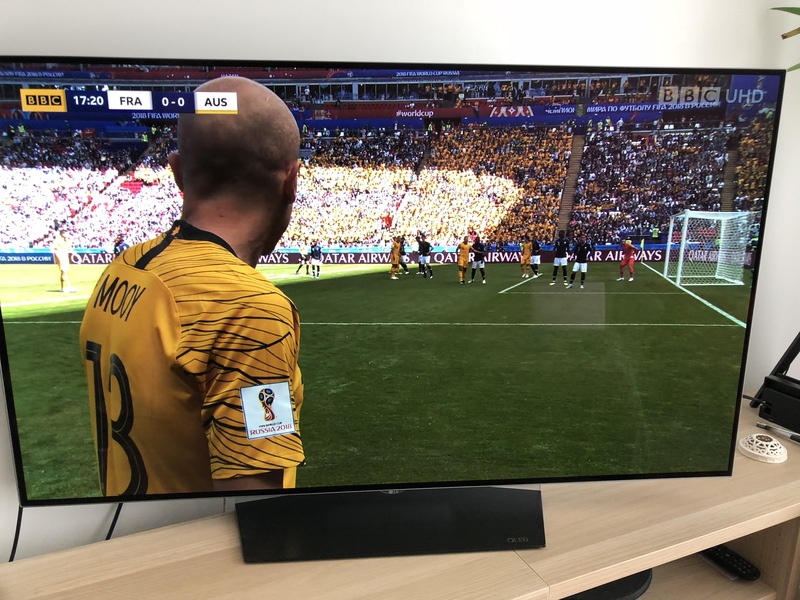 This means you’ll see much brighter colours, and more vivid differences between bright areas and shadows – this is very clear in today’s France vs Australia game as the sun was shining, but in yesterday’s games where it wasn’t, the picture did look much darker than we’re used to with SDR HD content. If this is a big problem for you, you can adjust your TVs settings to increase the brightness yourself – but know that what you’re seeing is more accurate. The following images (sorry about the shadows from my big windows!) shows the clarity provided by HDR where stadium casts shadows on the pitch and crowd. How does the picture get to us, are they using multicast? Whilst obviously being redundant, the main feed is brought back to us via IP, and then the BBC stream it to us via DVB-DASH, a form of HTTP Dynamic streaming based on MPEG-DASH. A question I had when this was announced was whether the BBC will be using multicast to reduce strain, but it seems this isn’t the case. While BT TV uses multicast for it’s own services (including UHD) it’s carried outside of the public internet on their own network. In theory it would be possible for iPlayer to use multicast, and I’m sure many ISPs would like this – it would require specific implementation by each ISP to make it work, which then makes it hard to test and probably specifically limited to the ISPs own hardware. 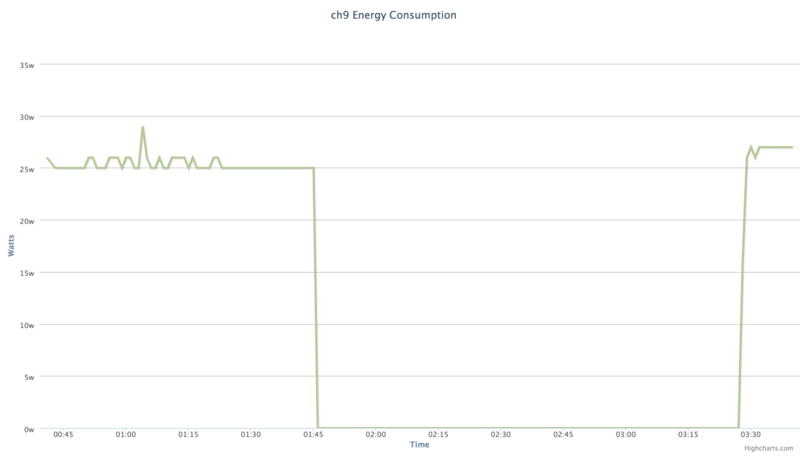 BT’s peak network throughput (that we know…) was 10.37 Tbps back in April. If the BBC allow 50,000 people to watch the UHD feed, that would generate 1.8 Tbps of data, almost 20% of BT’s entire peak traffic load, and that is why this is being run as a trial – it’s possible the UK’s internet infrastructure simply wouldn’t be able to cope. That said, it doesn’t appear that all the UHD slots have been filled for any games so far, so it might not be as popular as expected – or the BBC have more slots than expected. I suspect for the quarter/semi/final things could be busier. Off topic, but why isn’t The BBC World Cup Russia 2018 VR app working? This wasn’t quite worthy of it’s own blog post, but in case anyone at the BBC actually reads this, I wanted to note there is an issue with the VR app if you’re on a IPv6 connection. There appears to be an IPv6 network misconfiguration somewhere along the chain which means you can’t currently watch if your network supports IPv6. Turning off IPv6 (or switching to a mobile network which almost certainly won’t support IPv6) works. UPDATE: It looks like someone has fixed this now, as it’s working for today’s games!